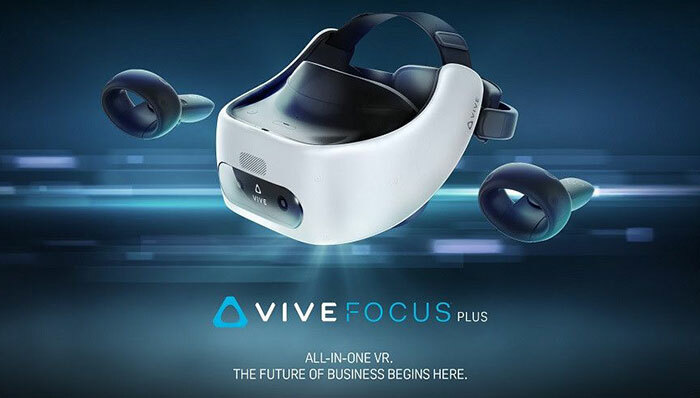 At the annual Vive Ecosystem Conference (VEC2019) in Shenzhen, China on Monday, HTC announced the Vive Focus Plus standalone virtual reality headset. This is a non-tethered HMD featuring enhanced visuals, extra comfort for extended use, plus immersive and intuitive dual-six-degrees-of-freedom (6DoF) controllers. The new HTC Vive Focus Plus brings a number of enhancements compared to the original model. First of all HTC has equipped sharper 'fresnel' design lenses which are said to significantly reduce the 'screen door effect' (a grid of lines) that is often seen in VR headset use. 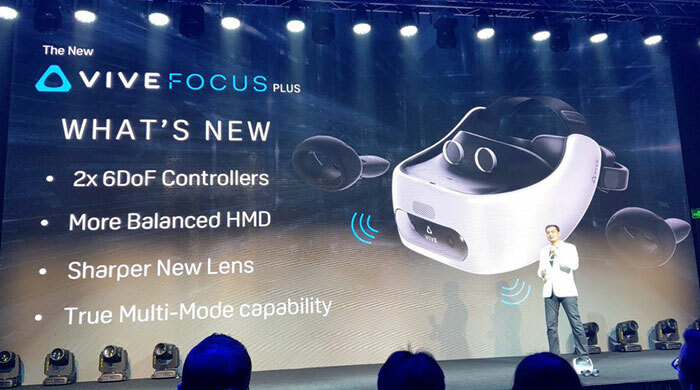 Secondly, instead of a single controller, the new Plus comes with dual 6DoF controllers. Another important upgrade for an enterprise device is that the HMD is now more balanced and more comfortable for extended productive VR sessions. HTC has introduced a new multi-mode capability turns a Vive HMD into a VR hub for multiple content sources. 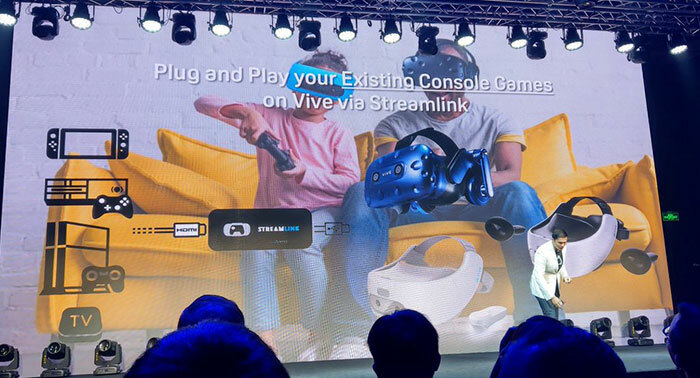 The so-called Streamlink app allows you to plug in a source such as a PC or games console enjoy a virtual theatre style experience with the headset. Engadget noted a slight lag between controller and action on screen when testing this feature connected to an Xbox One S so hopes that it is either improved or used for slower paced interaction. Even though the HTC Vive Focus Plus is a developer and enterprise device it can still be used for some gaming fun. HTC says that there are >250 native titles available via Viveport, with many able to take advantage of 6DoF controllers. Subscribers will be able to access all these titles for their monthly fee. Several new 6DoF applications were shown at the VEC2019 show, as were arena scale multi-player experiences such as a Paintball VR title which makes use of a haptic vest accessory. HTC will launch the Vive Focus Plus in mid-April for $799 in 25 countries worldwide and supporting 19 languages. Pricing is quite a step up in price compared to the original Vice Focus (launched at $599). 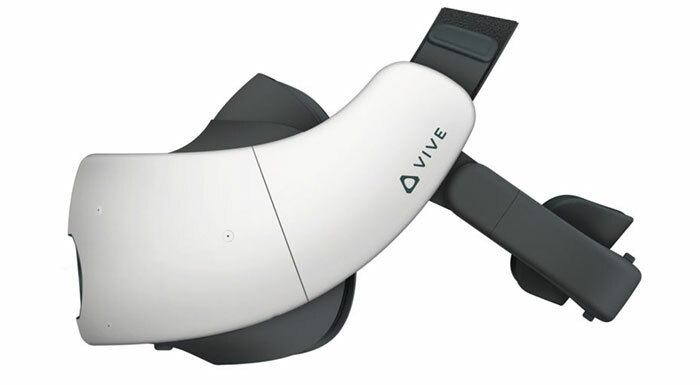 We are still awaiting availability and pricing details of the consumer focussed Vive Cosmos, as seen at CES 2019.